In this paper we consider logical inference as an activity that results in proofs and hence produces knowledge. We suggest to merge the semantical analysis of deliberatively seeing-to-it-that from stit theory (Belnap et al. in Facing the future: agents and choices in our indeterminist world, Oxford University Press, New York, 2001) and the semantics of the epistemic logic with justification from (Artemov and Nogina in Journal of Logic and Computation 15:1059–1073, 2005). The general idea is to understand proving that A as seeing to it that a proof of A is (publicly) available. We introduce a semantics of various notions of proving as an activity and present a number of valid principles that relate the various notions of proving to each other and to notions of justified knowledge, implicit knowledge, and possibility. We also point out and comment upon certain principles our semantics fails to validate. We would like to thank an anonymous reviewer for her/his useful comments and Claudia Smart for correcting the English. Also, we would like to acknowledge financial support from the Deutsche Forschungsgemeinschaft, DFG, project WA 936/11-1. 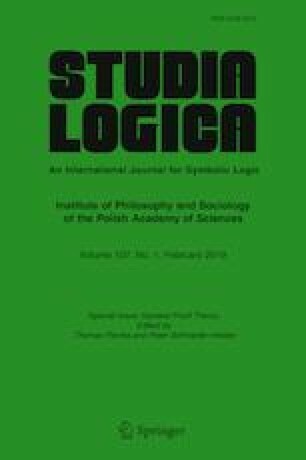 Olkhovikov, G.K., and H. Wansing, An axiom system and a tableau calculus for STIT imagination logic, Journal of Philosophical Logic First Online: 28 January 2017, https://doi.org/10.1007/s10992-017-9426-1. Segerberg, K., J.-J. Meyer, and M. Kracht, The Logic of Action, The Stanford Encyclopedia of Philosophy (Winter 2013 Edition), E.N. Zalta (ed.). http://plato.stanford.edu/archives/win2013/entries/logic-action/. Wansing, H., Remarks on the logic of imagination. A step towards understanding doxastic control through imagination, Synthese 194:2843–2861, 2017, published online October 2015, https://doi.org/10.1007/s11229-015-0945-4. Wansing, H., Falsification, natural deduction, and bi-intuitionistic logic, Journal of Logic and Computation 26:425–450, 2016, published online July 2013, https://doi.org/10.1093/logcom/ext035.